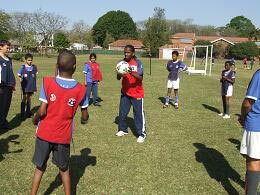 As part of our continuous social programme, two coaching clinics were conducted. On the 26 August 2008 a session was held at Clifftone Preparatory School in Nottinghan Road in the Midlands and on the 4th September 2008 the learners from St Christphers School had the opportunity to meet the United super stars and enjoy some coaching moments with them. Both sets of learners thoroughly enjoyed the sessions and the interaction with the first team players. The learners at St. Christopher’s really felt special as this school is for children with learning disabilities. 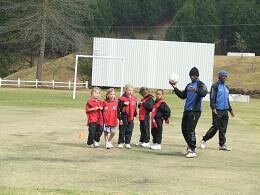 Sipho Mngomezulu United’s right wide player gets the learners of St. Christopher’s off with some dribbling exercise. 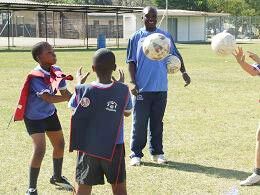 United’s Namibian first team goal keeper coach, Sparks Goeelieb helps the aspiring goal keepers from St. Christopher’s with some ball handling exercises. United’s long serving offensive midfielder, Lynch Pule addressing the heading technique to the learners during the session conducted at St. Christopher’s School.